Note to all authors : If you sent your article without formting template your article will directly be rejected. Your article will not be sent to the reviewers until it has been properly formatted as it suggested in Template Article and Guidelines Instructions for Authors (GIA). Many of the most prominent indices are very selective in the content they choose to accept, so it is imperative that authors carefully prepare their published work according to established guidelines in order to ovîde rejection. -	when two references follow each use coma as: [3,4]. end of sentence add number of references . suggested that…..and at the end of sentence add number of references . of sentence add number of references . at. Experience shows that for this part a few lines are often sufficient. avoiding getting into too much detail. Text Tahoma 10 pt. The authors should report their research methods in full detail. If your methods are unusual, please report both successes and difficulties so that other researchers can learn from your experience. Text Tahoma 10 pt., Describe the technical statistics used in data analysis in detail, test used type of sofwear used to make analyzise. You can give the results of your work under the title of "RESULTS". Insert the Figure and Table into their place on article. Results should be presented in a logical sequence in the text, tables and figures. Repetitive presentation of the same data in tables and figures should be avoided. 3.1. Table, Figure, Photographs: All Table, figures, drawings, graphs and photos should be placed in numerical order in the text and have enough resolution (min. 300 dpi) to be easily followed by the reader. Color photos and drawings are also acceptable. 3.3. Units of Measure: All scientific measurements should be expressed in SI units. 3.4. Equations: All equations are centered on a line with preceding and succeeding blank lines to separate them from the text and numbered. The equation numbers appear at the right-hand-side of each equation (near right margin) written in parentheses "( )", e.g. 3.5. Nomenclature and Units: use international nomenclature. SI units (meter, kilogram, etc. ), as outlined in the latest edition of Units, symbols and Abbreviations: A Guide for Medical and Scientific Editors and Authors (Royal Society of Medicine Press, London), should be used wherever possible. 3.6. Abbreviations: For the purpose of simplicity, write the full term for each abbreviation at its first use in abstract, and text. Define the abbreviation inside of parentheses. The results should be discussed in relation to any hypotheses advanced in the Introduction. Comment on results and indicate possible sources of error. Place the study in the context of other work reported in the literature. If possible discuss also the limitation of the study. This should be after conclusion and not be more than 80 words. Type the word "Acknowledgment" as a sub-heading (Without any number; Color Sky blue, Tahoma10 pt., bold-face)) followed by the text. Please acknowledge your research funding body and/or other organizations that have contributed to the research. not parent or colleagues in your institution. Any grant or corporate sponsorship should be noted here. accordance with the examples given at the end of this instruction (Tahoma 8 pt.). - when two references follow each use comma as: [3,4]. - When references are different and not follow each so use dash to separate references that not succeed, for example: [3-9] or [3-9,10,11]. sentence give references in bracket as  . for exp: Albert (2015) ................... that the level of IGf 1 incresead by 90% . end add the numerical order of this references for exp: Alain et al. (2015) ...................... the level of IGf1 increased by 80% . for exp. : Alain and Monarc (2014)..................................the rol of IGf 1 is importnat to reduced breast cancer . - At the end of the article list all references in numerical order as they appears in the text (Use Vancouver style). your article will be rejected. Were available, URLs for the references must be provided. When there are six or fewer authors, cite all of them. If there are seven or more, then cite the first three followed by et al. 1. Huynen MMTE, Martens P, and Hilderlink HBM. The health impacts of globalization: a conceptual framework. Global Health. 2005;1(4): 14-18.
without written consent of all the contributors. available for any other purpose or to any other party. as an Acrobat PDF file and should be returned within 3 days of receipt. The main conclusions of you study should be presented. Authors will describe the contribution of the work to the scientific community or/and the practical applications of their research or its economic implications. Also, all authors are encouraged to ask: is there anything the community should be doing differently as a result of your research? Have you identified areas for future research? If so, please state them here. (Abstract text Tahoma 9 pt. )Type the word "ABSTRACT" as the major heading (without any section number). The abstract must not exceed 350 words and must be structured as follows: Background, Objectives, Methods, Results, and Conclusions . The text is given following the affiliation and leaving three blank lines. If the manuscripts write in French the English translation of abstract will be made. Keywords: Type the word "Keywords" in italic characters. Keywords related with the study must be given in minimum number (maximum six words) and separated by commas (Tahoma 8 pt.). Also the keys word cited must be different from that in the Title of paper. Manuscript preparation includes information on fonts, spacing, word, figure and table, manuscript Title Page, Major Headings, Sub-heading, Secondary Sub-heading, Abstract, Introduction, Materials and Methods, Statistical Methods, Results, Figure Illustrations, Photographs, Table, Units of Measure, Equations, Nomenclature, Abbreviations, Discussion, Conclusion, Acknowledgments, References, Authorship Criteria and Conflicts of Interest. We accept a manuscript on the understanding that it is reporting unpublished work and that it is not under consideration for publication elsewhere. During evaluation the AJIRAS teams use a plagiarism analysis. The manuscripts should be written with MSTM Word or with, RTF, WordPerfect document file format, Open Office, with character size of 10 Tahoma. Articles prepared on Mac systems should be saved in Word for Windows compatible format. Articles prepared in LaTeX may be submitted in PDF format for use during the review process. After acceptance, however, .text files will be required. Please DON’T insert page numbers and DON’T write anything in the Headers and Footers part of the pages. Manuscripts should be written in English or French and typed on single-sided A4 paper. Research articles should include the following, each beginning on a fresh page: title, abstract, introduction, methods, results, tables and figures, acknowledgements, discussion, references. The text must be single spaced with margins left and right of at least 1cm. Title of the Paper: It is written in capital letters (Tahoma 12 pt., bold-face) centered on one or more lines. For articles in French, the English translation of the title should be made. The first page of manuscript should contain an informative title, the first name, and last name of each author. The page should also include the name of University/institution (s), department, city and country to which the work should be attributed, and the name, address, and email of the author responsible for correspondence about the manuscript . Names of the Authors: Leaving two blank lines after the Title of the paper, the names of the authors are written (Tahoma 12 pt., bold-face) centered on a line, separated by commas. Affiliations: are written (Tahoma 8 pt., bold-face) It is written following a blank line after the Names of the Authors and centered on a line. For authors having different affiliations, superscripted Arabic number (i.e. Michael Maroua1, 2, 3) are given to the names of the authors and different affiliations are written separately. Major headings such as ABSTRACT, INTRODUCTION, MATERIEL AND METHODS, DISCUSSION, and REFERENCES should be written in capitals (Color Sky Bleu, Tahoma 12 pt., and bold-face) and numbered. Sub-heading: A sub-heading within a section should be typed with first letter of words in capitals (Color Sky blue, Tahoma10 pt., bold-face) and numbered and followed by ".". Then, the text continues (Tahoma 10 pt., Bold Face). Secondary Sub-heading: Beginning letters of sub-heading should be typed with capital letters (Color Sky blue, Tahoma10 pt., and bold-face) and followed by ".". Then, the text continues (Tahoma10 pt., Bold Face). to maintain public trust in the research published for public benefit and research development. 1. The manuscript has not been previously published, nor is it before another journal for consideration (or an explanation has been provided in Comments to the Editor). 2. The manuscripts file should be written with MSTM Word-2007 or higher versions or with, RTF, WordPerfect document file format or Open Office. Articles prepared in LaTeX may be submitted in PDF format for use during the review process. After acceptance, however, .tex files will be required. 3. Where available, URLs for the references must be provided. 4. The text is single-spaced; uses a 10-point font; employs italics, rather than underlining; and all illustrations, figures, and tables are placed within the text at the appropriate points, rather than at the end. 5. The text adheres to the stylistic and bibliographic requirements outlined in the Guidelines Instruction for Authors and Template Article. 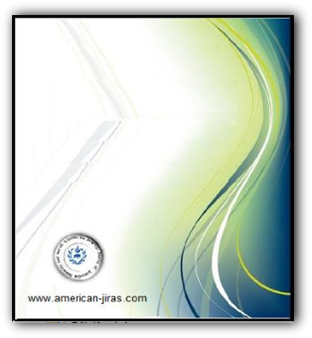 Authors who are unable to provide an electronic version or have other circumstances that prevent online submission must contact the Editor prior to submission to discuss alternative options; email: | americanajiras@gmail.com | or | ajiras@american-jiras.com | or sending us a letter to the office adress at: | JF 22 cours Wellington, Le Clairval, 76170 Lillebonne | France |. The Publisher and Editor regret that they are not able to consider submissions that do not follow these procedures. To make sure that you can receive messages from us, please add the 'american-jiras.com' domain to your e-mail 'safe list'. If you do not receive e-mail in your 'inbox', check your 'bulk mail' or 'junk mail' folders.